The Good Luck Cat. "Korat" roughly translated means "Good Fortune." Discovered in Ampur Pimai of the Korat province in Thailand. The earliest known record of the Korat appears in The Cat-Book of Poems or Smud Khoi of Cats, produced in 1350-1767. This book presents the seventeen "good luck" cats of Thailand, including the Korat, and is presently located at Bangkok's National Library. It was named by King Rama V when he was asked where that cat had come from. There is much tradition and folklore behind the Korat. According to one of these folk tales, Korats with kinks in their tails are said to increase your luck. "The cat Maled has a body colour like Dok Lao.The hairs are smooth, with roots like clouds and tips like silver.The eyes shine like dewdrops on the lotus leaf." Translation: Dok means flower, and lao is an herb, like lemongrass, with silver-tipped flowers. Treasured by the Thai people and once owned only by royalty and members of the government, the breed spread across the globe very slowly. Korats did not arrive in Europe and North America until the late 1960's. Korats are extremely expressive. You can look at Korats and almost know what they are thinking; and the scary part is they "do know" what you are thinking, as well! It's a look which wins you over completely! Once you meet and live with a Korat, you'll understand. They are extremely observant, will watch everything you do and then try to duplicate it. korats are extremely loyal to their owners, giving their total love and respect. Korats are either going 100 mph around the house or they want to be with you, near you, and helping you all the time. If you are doing things around the house, you will always have several following and "helping" out! They aren't "in your face," but like to be involved in your activities. When you have visitors they will explore their belongings, coats purses etc, and anything left out all become the property of the Korat - including your friends! This is the cat with five hearts, three of which are on the head. Looking at the Korat straight-on, you see the Valentine-shaped heart of the head, which can be gently traced around the head. The second heart is found by looking down over the top of the Korat's head, and the third heart is the nose. The other two hearts, which are not part of the head, are the muscular area of the chest when the cat is sitting, and the most-commonly-forgotten one, the heart inside the cat! As the cat matures, the heart shapes on the head become more pronounced. The eyes are large, wide-open, luminous, alert and always observant. The colour is peridot green in the mature cat (two to four years of age), but kittens have an amber to golden-green eye colour which gradually changes as they mature. The Korat has a unique colour matched by no other breed. It is defined as silver-tipped blue, and it gives off an aura, or shimmering effect. The Thais describe this color as "rain-cloud gray," and the silvering effect as "sea foam." The colour appears to absorb light, giving a "halo" effect. It is a single coat, short, and close-lying. The roots are light silver blue with the colour increasing in shade up the shaft to a deeper blue until it reaches the tips, which are silver. The silver tipping is more prevalent on the muzzle and toes. 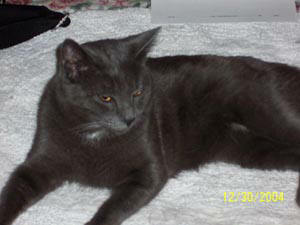 The Korat is also only one color - silver-tipped blue; there is no other colour accepted. Abundant tips are preferred. Rare and highly prized, every modern Korat is believed to trace its ancestry to the original cats. © 2006-2019 AnimalPets.org. Page generation 0.001 seconds.